MPR Music - Opera Comes to Lake Wobegon? Prologue. A doctor recalls his last encounter with Poe. Poe, whose young wife Virginia died two years earlier, appears ill and feverish, his creativity at an end. He plans to sail to Baltimore that night, despite the doctor's belief that no ship is scheduled to depart. Poe insists, for his literary executor Griswold has told him of one. The doctor warns him against Griswold, but Poe is determined to embark on his 'voyage of discovery'. Scene I. Alone on the dock, Poe awaits the ship. 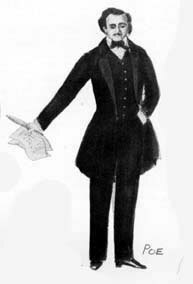 Griswold appears, dressed as a Ship's Captain. A ghostly vessel materializes out of the blackness. Strange phantoms drift across its decks. They draw Poe onto the vessel which again disappears into the mist. Scene II. In the ship's lounge a small troupe of actors is presenting a melodrama. Poe becomes aware that it is a reenactment of his own mother's death when he was a small child. He is drawn into the scene which becomes 'real' to him. 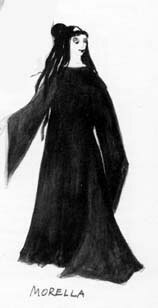 The mother dies and a sheet is drawn over her face. 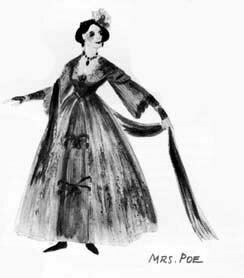 The actress playing 'Mrs. Allan' gleefully adopts him, chiding him for drinking and gambling while at the University. Bewildered, Poe protests that he lacked funds. Griswold, now dressed as Mr. Allan, pops up from beneath the sheet formerly covering the corpse of Poe's mother and berates his foster-son for lack of occupation and refuses to lend him more money. Insults are exchanged and the two men grapple amid the bedclothes. In the confusion, Poe finds himself wrestling with a large rag doll of Virginia. Griswold has disappeared. Scene III. On a body of still water a small boat in which Virginia is seated glides into view. Poe steps into it and together they move over the water, reliving happy memories of their love. A second boat appears bearing Griswold and a woman whose face is averted. As it drifts past Poe, the woman turns toward him and smiles: it is his mother. Without speaking, she turns back to Griswold with a seductive expression on her face. The two boats glide away into darkness. Scene IV. A wedding procession is forming on the small make-shift stage. Poe is pushed forward to take part in the ceremony, for it is his own wedding. 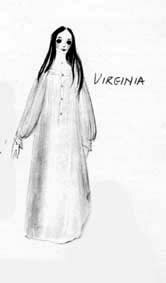 Virginia appears in wedding veil and gown but clearly a child of twelve. There are shocked whispers and giggles as the ceremony proceeds, with Griswold, now costumed as the minister, officiating. Poe declares he is too poor to marry. He is advised to appeal to Mr. Allan. The minister instantly turns into Mr. Allan. Poe attempts to beg for funds and an argument ensues. In rage, Allan disinherits him and disappears. In his place stands the minister, pronouncing Virginia and Poe man and wife. Scene V. In the lounge, passengers are preparing for a masquerade party as a storm is rising. Poe wanders among them, appealing for help, for work. The theatre director suggests that he give a lecture and thus make some money. Poe's attempts are hindered by the jeering of the crowd and by a disembodied voice singing 'Annabel Lee.' In his feverish imagination, he believes it to be the voice of his dead wife. He is assured it is merely a ballad-singer, who presently enters. Poe sees in her his dead mother once again, who, like Virginia, died while singing to him. To blot out the dreadful vision, he drinks excessively. The carousing grows more violent. Poe continues to hear a distant voice singing 'Annabel Lee' even though the ballad-singer is now beside him. The others are amused by his hallucinations and crown him a member of their mad company as the violence of the storm increases. In desperation, Poe cries out that he knows Virginia is just outside the door. A sudden gust of wind blows open the door revealing Virginia in blood-stained bridal clothes. Poe rushes to embrace her as Griswold and the others erupt in macabre laughter. Virginia falls to the floor, bearing Poe with her. Scene VI. The lounge as last seen except that the passengers are now dressed in normal clothing. There is no suggestion of hallucination and no trace of Virginia. Poe, clutching a blood-stained bridal veil, struggles back to consciousness. Confusedly, he recounts the preceding events and the passengers conclude that he is insane. 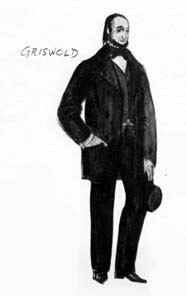 Poe's fictional detective, Auguste Dupin, suggests a trial to contest the charge of madness. Griswold, now in scarlet robe and judicial wig, prepares to hear the testimony. Dupin invokes a reconstruction of past events in his client's life. Scene VII. Poe's cottage on the day of Virginia's death. Her mother, Mrs. Clemm, and neighbors are gathered at the deathbed. Poe, with a priest (Griswold), watches from a distance. When Virginia calls to him, he moves forward and kneels beside her. She sings of'Annabel Lee' and then expires. The priest urges Poe to confess that he longed for his wife's death, that he needed her suffering to inspire his art. Poe fiercely denies the accusation. The priest conjures up a vision of Poe's future actions to serve as proof. Scene VIII. A bizarre auction over which Griswold presides. Various women, prominent in Poe's final years, are offered as possible muses for his flagging imagination. One by one they come forward through a mirror-frame to confront Poe with their charms. The scene becomes more and more nightmarish as they struggle for his attention. They begin to divest themselves of their 'parts' for his edification, offering a leg, an arm, a heart. Poe utters a terrifying scream and the vision abruptly dissolves. Scene IX. Still kneeling at Virginia's bier, Poe can no longer deny the priest's charges even though he will not admit his own guilt. A sound is heard, a heartbeat. The body of Virginia comes to life in his embrace. Despite a warning not to ask about the land beyond the grave, Poe, in his wild excitement cannot refrain. Hesitantly and painfully, Virginia tells him of the other world 'where gold and silver fish swim through the river of silence.' She falters, begging him to ask no more. He persists. Her voice rises in ecstasy as she describes the 'valley of the many-colored grass;' then abruptly ceases. Clutching her throat, she falls back lifeless in Poe's arms. Poe now recognizes his guilt: she died again, victim of his creative life. Scene X. The trial resumes. Dupin asks the court to be merciful. Judge and jurors remain unmoved and ridicule Poe's own defense. Driven to rage, Poe seizes a sword-cane and lunges toward Griswold, standing mockingly in the mirror-frame. "Who dares judge me," Poe cries. "Myself," replies Griswold, "Your soul. Your secret self." With a despairing cry, Poe stabs at the image in the mirror. But his nemesis has disappeared and in his place stands an image of Poe himself. With welcoming gesture, Poe's image stretches out his arms to receive the blows. The dock. Dawn. Poe stands in the mist alone. There is no suggestion of a ship. Unseen by Poe, Griswold emerges from the shadows and watches him. The disembodied voice of Virginia is heard from far off singing the final phrases of 'Annabel Lee.' Poe sinks down, dying "by the side of my darling, my life and my bride, in her sepulchre here by the sea." Virginia's voice dies away and the manuscripts drop from Poe's hands. The doctor is heard calling for Poe. He enters and discovers Griswold standing over the body. The doctor explains that Poe wished to take ship last night, but Griswold assures him that no vessel departed. He disappears into the dark while the doctor remains kneeling by the body of Poe.